"We have been helping you design your next event since 1982"
Here you can plan and design your next party or let us do it for you. We can put it all together for you or supply all you need to do it yourself. Balloons can fill up a large space with a low budget. This is behind a head table for a 40th Birthday party. Balloons can be very simple and elegant. 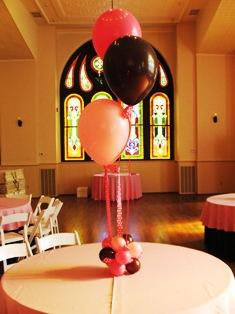 This is a simple centerpiece made up of helium and small airfilled balloons with a wide polka dot ribbon. Or balloons can be artistic and creative. 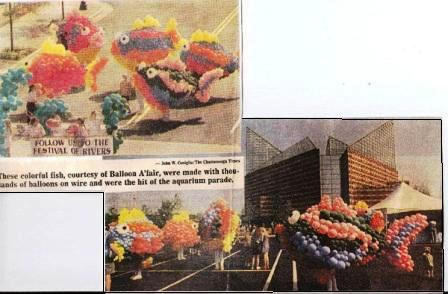 These large balloon fish were made for the Tennessee Aquarium's opening day parade. They were designed as a costume and were carried by Hixson High School students.